A huge part about fixing and making things better is about empowerment. Being able to re-imagine stuff you own and improve your environment using your ingenuity is hugely rewarding. This is especially true when you’re applying that creative ingenuity to helping others. No matter how big or small, fixes and creations that allow people to live their life more independently have a lasting impact. We see it every day within the Sugru community - like the time Myles improved his daughter’s wheelchair, or when Katherine made a tap safer for her visually impaired grandma. Cue in Fixperts - a social project comprised of a group of individuals from various personal and professional backgrounds who encourage people to use the power of fixing to solve everyday problems. They champion the idea that everyone should feel confident to find solutions for themselves and others. We caught up with Maya Alvarado, Fixperts resident and product designer at Benchmark Furniture. She tells us more about the ethos of Fixperts and how everyone can make a difference in people’s lives. Tell us a little bit about your background, Maya. I have always loved making things. In 2015 I graduated from Kingston University’s Product & Furniture BA, and this was a wonderful chance to develop projects in a very hands on manner. It was there, in my first year that I first got involved with Fixperts through their pilot programme at the Stanley Picker Gallery. From this point on I have been inspired to work in the social sphere, and I have just completed a one year Fixperts Residency at Benchmark Furniture. What was the driving force behind Fixperts? At the outset the driving force behind Fixperts was a straightforward desire to get people who are good at making to fix and repair for others; we asked designers to use their skills to improve other peoples lives in an immediate way and then to share the fix to inspire others to do the same. With time that’s evolved; as we saw universities around the world pick it up as a teaching method and use it to engage their students, we started to realise what a powerful tool it is for learning. We’re now driven by the belief that Fixperts can change the world; not in terms of fixing or repairing or even educating better designers, but because Fixperts makes better people. Fixperts focus on students emotional and social engagement, as well as their creativity and skills, makes for a more engaging process and a more powerful one. That’s one of the reasons we’ve started to work with schools as well as universities, and have broadened out from design to engineering, STEM and other related subjects. We want to influence a generation of socially minded, imaginative, resourceful, skilled fixers! How does Fixperts work? Can anyone get involved? Fixperts is a creative social campaign and design education programme that connects people through the act of ‘fixing’. We use fixing as a way to develop creative problem solving skills and understand the power we have to make a positive social impact on the world around us. A Fixperts project brings together a team of Fixperts, people with imagination and skills, with a Fix Partner, someone with a worthwhile challenge in their day to day life. They work together to research and develop solutions, sketch out ideas, model prototypes and make a final product to gift to the Fix Partner. The story is captured in a short video and shared with others in the form of a Fix Film, like this story of Edna and her Sockhorn. There are over 250 FixFilms which have been watched over 400,000 times, and over 25 universities have participated in 22 countries. Fixperts also runs a schools programme and provides resources for teachers. Anyone can get involved – if you would like to become a Fixpert visit Fixperts.org and get in touch. What kind of design ideas / principles do you implement most often to improve someone&apos;s life? When designing for a specific person in mind, I believe listening is the most important part of the process. The initial meeting should be about getting to know each other, sharing experiences and observing the opportunities to make positive change. Quick prototyping with a range of inexpensive materials is very useful for early solutions to a problem. 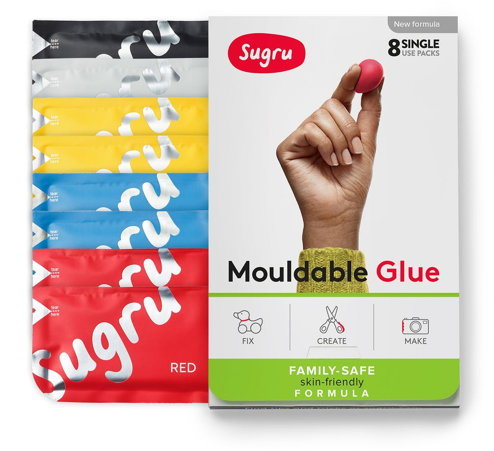 Sugru is one of these great materials to use – it can be moulded, sculpted, fused and pressed, and was very helpful in both the research and final production of a design. We know it&apos;s really difficult to choose, but is there a project you&apos;ve worked on that&apos;s really stayed with you? One project from this year that has stayed with me is called ‘Heidi’s Canoe Expedition’. Having previously designed a bespoke set of cooking utensils for 18-year-old Heidi (pictured above), who has cerebral palsy, her tutor Fee contacted me to see if I could create a canoe paddle that would be comfortable for Heidi to use. Our first session on the water saw a trial of wearable paddles which were too heavy when Heidi’s muscles relaxed, this prompted me to build a freestanding system to provide on and off time depending on her muscle tension. The project taught me to respond fast to what worked and what didn’t and to quickly make the necessary changes – often in the canoe. We had a lot of fun on the water and Heidi was delighted to complete her two-day Duke of Edinburgh’s Award challenge in Oxford. How would you like to see people applying the Fixperts&apos; ethos in every day life? Everyone has an innate ability to fix things, whether it is a folded napkin to prop up a shaky dinner table or a duct taped wing mirror, we naturally place physical items together to fit the right purpose. This knowledge of how objects can be applied to perform a function is what fixing is all about. Anyone can be a Fixpert, you do not need to be a designer. Why not see if a relative or friend needs something fixing? Fixperts was founded in 2012 by Daniel Charny together with our very own co-founder James Carrigan (yes, crazy James from the videos!). It has gone on to grow into an amazing team including lots of volunteers and is now being run as a module in schools and universities all around the world. Watch the videos on their site, we promise you’ll be truly inspired! James also did a a talk at TEDxDublin about this, which you can watch below.